This week's Western is Way Out West (1937) starring the legendary comic duo of Stan Laurel and Oliver Hardy. They are with Dinah the mule in this scene from the film. Way Out West is one of the finest and funniest of Laurel and Hardy's 23 feature films. The film, directed by James W. Horne, is many things at once: a traditional Western, a knockabout comedy and one of the most charming musicals ever produced in old Hollywood. A vintage poster for Way Out West (1937). 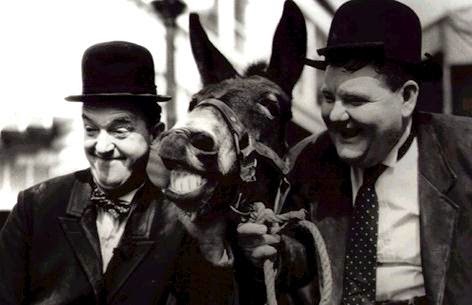 Laurel and Hardy are so fixed in the public consciousness as a duo -- even those who have never seen an old Hollywood film are familiar with their image -- that it is hard to think of them separately, but it is really only a twist of fate that brought them together. Laurel was born Stanley Jefferson on June 16, 1890, in Ulverston, England, to a theatrical family. Laurel began his stage career at 16 and soon he became a hugely popular star on the English music hall circuit. 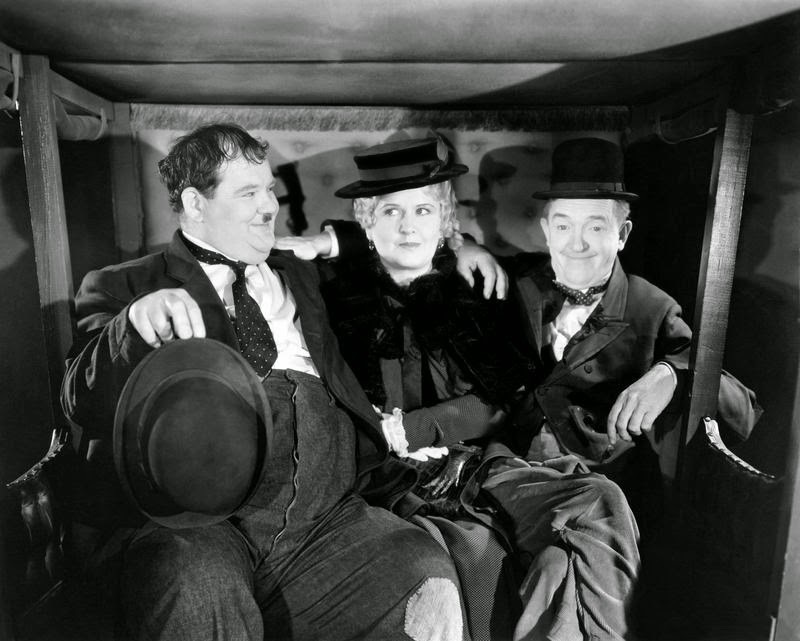 Mr. Laurel and Mr. Hardy enjoy some mixed company on the stagecoach in Way Out West (1937). Laurel immigrated to the United States in 1912 (he started using the stage name Stan Laurel while touring the U.S.). At first, he worked in vaudeville as a team with his common-law wife Mae Dahlberg. The pair made their film debut in Nuts in May (1917). Dahlberg and Laurel eventually split up, but Laurel continued appearing in silent films. In 1925, he signed with the Hal Roach company with the hopes that he would move behind the cameras and become a director and writer. A publicity still from Way Out West (1937). Harlem Georgia's most famous son was born Norvell Hardy on Jan. 18, 1892 (he would later change his first name to honor his late father). Hardy was operating a movie theater in Milledgeville, Ga, when he decided that he could do a better job than the actors he was watching onscreen. Hardy packed up and left for Jacksonville, Fla, which at that time had a nascent film industry. In 1917, Hardy moved to Hollywood to seek greener pastures. 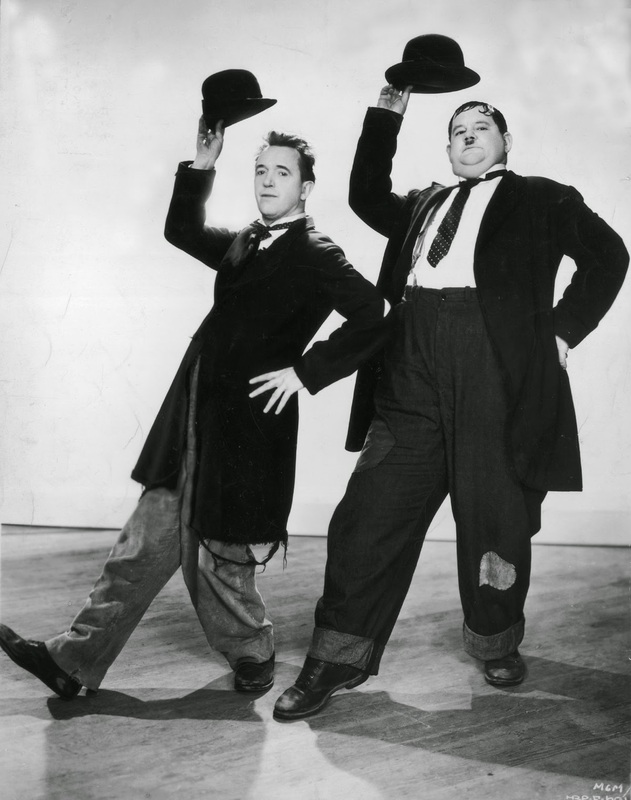 Both Laurel and Hardy were part of Hal Roach's comedy all-stars when director Leo McCarey noticed that the two comics worked well together. They were officially teamed up in 1927 for the short film Putting Pants on Phillip. Laurel and Hardy's onscreen personas were beloved by moviegoers around the world by the time they made Way Out West. Laurel, known as the thin one, was shy and childlike, easily hoodwinked and terrified of women (in real life, Laurel was married four times, twice to the same woman). 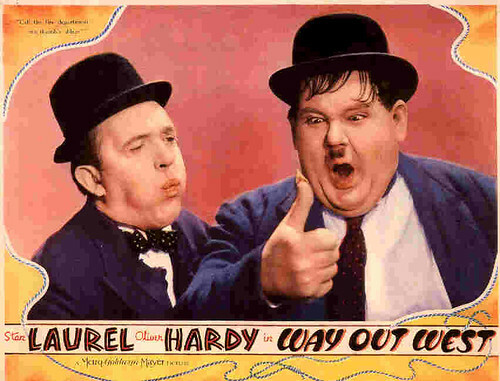 Hardy, the fat one, was an over-confident blusterer, who was always being taken in by ruthless swindlers (In Way Out West, Hardy believes that buying the Brooklyn Bridge is a good decision because "it's going to make us a lot of money some day"). 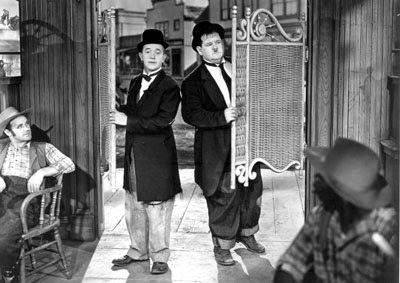 Stan and Ollie check out the saloon in Way Out West (1937). Way Out West does have a plot-- it involves a gold mine, a fair maiden (Rosina Lawrence) and perennial Laurel-and-Hardy villain James Finlayson at his nefarious best -- but that's hardly the point. 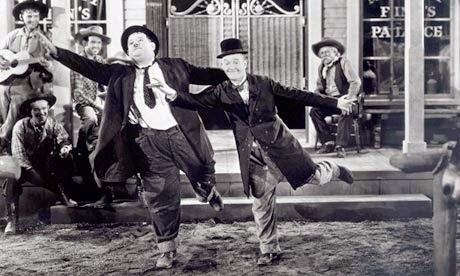 Instead, the film is crammed with joyous set pieces like the boys trying to cross a river by mule and especially Laurel and Hardy's immortal soft-shoe dance to At the Ball, That's All (better known as Commence to Dancing). Way Out West is widely available for streaming on the Internet. It is also available on DVD. Next week's Western is The Moonlighter (1953) starring Barbara Stanwyck and Fred MacMurray.